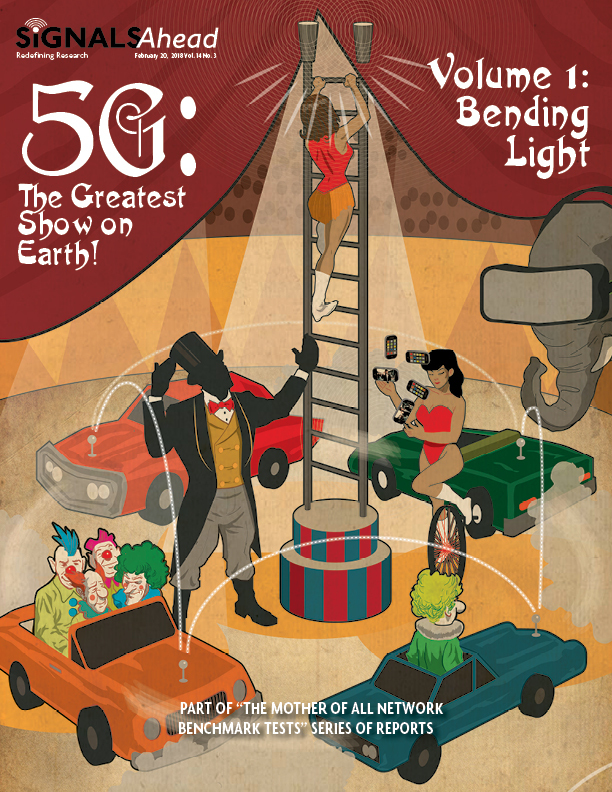 5G: The Greatest Show on Earth! SRG conducted what it believes is the first independent benchmark study of an operator’s 5G network. For these tests, we used the Verizon Wireless 5GTF network in Houston, Texas where Samsung is the infrastructure supplier. Although the 5GTF specifications are not compatible with the 3GPP 5G NR specifications, we believe the performance characteristics of millimeter wave are very similar between the two sets of specifications. Our Thanks. We did this study with the support of Rohde & Schwarz, who provided us with its TSMA autonomous drive test scanner to collect the data. SRG takes full responsibility for the data collection and the analysis provided in the report. Our Methodology. We used a combination of walk tests (omni antenna) and stationary tests (horn antenna) to collect the data. We tested in neighborhoods that we believed were under coverage of the macro cell sites. We also conducted stationary tests at select locations, including tests to evaluate the sensitivity of millimeter wave frequencies to foliage, ground clutter, distance, diffraction, and passing vehicles, for example. The Results. Millimeter wave signals are far more resilient than we expected, even at distances exceeding several thousand feet. Tree foliage, passing school buses, buildings, glass, and parked cars impacted the received signal, but the resultant signals were still capable of delivering meaningful data rates. However, promising Gigabit data speeds to all homes may prove to be challenging, especially in the near-term. A Must Read. This report is a “must read” for any organization interested in 5G millimeter wave performance and the promises of 5G.